CULTUS DEORUM ROMANORUM: Everything you know about Stoicism is wrong. Everything you know about Stoicism is wrong. William B. Irvine may not realize it, but he has succeeded where reconstructionists all too often fail. He has created a modern version of Stoicism that is based closely on ancient sources. Not just an ancient philosophy text, careful reasoning is used to present a coherent philosophy of life that is actually workable in today's world. Some time ago I posted a small notice about Lifehacker's piece on Stoicism. 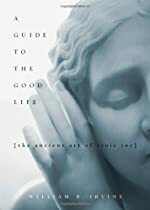 I took my own advice and I bought a copy of Professor Irvine's book, "A Guide to the Good Life: The Ancient Art of Stoic Joy". In it, Irvine offers a well-grounded and scholarly, but very readable, discussion of Roman Stoicism and shows how it can be a practical modern philosophy of life. As the quote above illustrates, Irvine's book is focused mainly on the Roman flavor of Stoicism. He starts where reconstructionists must often start; eliminating misconceptions. Irvine is careful to describe not only what Stoicism is, but also what it is not. Unfortunately, what it "is not" is pretty much what many people think it is. Thankfully, Irvine is able to clear up modern misconceptions in a lucid, non-technical way. Some readers of this blog may be among those few unusual individuals for whom this is not necessary, but even so, these parts are worth reading for their very clear explanations. The three chapters of Part One ("The Rise of Stoicism") provide a concise history that places Stoicism in the context of its time. Irvine first sets up the environment in which Stoicism was born. Then he outlines the lives and contributions of the first Stoics, detailing the development of Zeno of Citium, first as a student of the Cynic Crates, then his later studies under Stilpo the Megarian and Polemo of the Academy. Finally he moves on to the development of Stoicism under the Romans, discussing Seneca, Musonius Rufus, Rufus' student Epictitus, and Marcus Aurelius. Irvine's biographical sketches are lively and informative, giving a human touch to what otherwise could be a very dry subject indeed. The five chapters of Part Two ("Stoic Psychological Techniques") detail some of the general approaches that were advocated by the Stoics. The first of these, "Negative Visualization", has attracted the most attention. This is reasonable because this technique is easy to explain and can be applied alone, apart from a general practice of Stoicism. This does not mean that the other techniques (dealing with issues such as self-control and meditation) are difficult or esoteric. Reading this part of the book alone is possible; it does not depend on the first part for background or the next part for explanation. And although reading just this part would be useful, I don't recommend it. There is no reason to miss out on the other parts. I do imagine, though, that readers will tend to return to this part quite often. On the first reading, Part Two amounts to an introduction to applied Stoicism. It is clear and engaging enough to read right through. Going back to this part, though, affords a chance to focus more on the details and to follow up on some of the primary sources in the notes. Part Two then becomes more of a graduate seminar in Stoical techniques. Part Three ("Stoic Advice") deals in eleven short chapters with specific issues (e.g., duty, insults, anger, old age) that we all face and that the Stoic writers dealt with. As one might expect, Irvine shows how the techniques from the earlier chapters can be used in these situations. Some of the chapters ("Duty", "Social Situations", "Insults") are clearly applicable (I suppose) to everyone's life as it is now. Other sections ("Grief", "Old Age", "Dying") deal with issues that are inevitable, even if not immediately relevant in any given case. Their inevitability makes them relevant, and Irvine shows how Stoicism not only helps us deal with these things, but to prepare for them. "Seeking Fame" and "Luxurious Living" may not speak so directly to us, but they still deal with aspects of modern culture that we cannot really avoid. Reading all of these sections, it is hard not to think "I want to be a person who deals with this situation in this way". Readers who are familiar with Cicero's On Duties will note that the explanation of social duty given there matches pretty well the explanation given by Irvine and attributed to Marcus Aurelius. Cicero wasn't a Stoic, but the fact that sometimes things that he said seem "Stoical" suggests that we are getting close to Roman cultural bedrock. In short, serious reconstructionists, those who really want to try to "think Roman", should pay close attention, because there is a lot of valuable material here. Part Four is titled "Stoicism for Modern Lives". Having established just what being a Roman style Stoic means, Irvine turns to the place of Stoicism in today's world. Stoicism poses a challenge to a number of prevailing views. It seems to run counter to modern notions of psychology and all of the attitudes and practices that flow from it. Stoicism also seems to be at odds with modern ideas about politics and philosophy as well. Roman Stoics never addressed these things, obviously, so Irvine's challenge is to answer for them, as they might have done themselves. The real usefulness of everything that came before depends on his success, which is up to each reader to judge. Note that Irvine doesn't need to show that Stoicism is better than the modern alternatives, just that it is a reasonable choice for some. Irvine rounds out chapter 21 discussing just who those people may be. Those who adopt any particular philosophy of life need to do more than select it, they need to practice it. This is where the book most clearly becomes not about Stoicism but for Stoicism. Recent popular writing on Stoicism from authors as diverse as Tom Wolfe and Admiral James Stockdale may talk about the benefits of Stoicism, or what it is, but no-one that I know of so clearly describes the process of becoming a Stoic. Irvine offers specific advice for the novice Stoic and anecdotes from his own experience. Those who attempt to adopt Stoicism as a philosophy of life will naturally find their own ways to apply the techniques that Irvine describes earlier in the book. His experiences, then, will serve more as examples than as a strict program. A short final chapter. "A Stoic Reading Program" rounds out the book. This is a sort of annotated reading list that points to some recommended editions of the Roman Stoics and other useful, modern books. I have collected most of these selections in the bookstore. Through the idea of pietas, the Cultus Deorum shows us the importance of interaction not only with the Gods, but with others; one's family and one's community. Irvine's chapters on duty and on social relations show how Stoicism can help us to fulfill the requirements of pietas. There is a lot of chatter in the Roman recon world about "Roman virtues", but very little depth or advice on how to go about fostering them in one's self. Living a virtuous life is a subtext of Irvine's book. To my mind he has done more to advance "Roman virtues" than all of the online discussion I have seen on this topic. Professor William B. Irvine's website is at http://williambirvine.com/ .